I had hoped to get Lillie (my oldest granddaughter) out to shoot at least one more time before deer season but it didn't happen. So Friday November 2nd we headed for the farm and prepared to hunt the opening day of youth season Saturday. Hoping for a productive day Saturday but prepared to stay the night and hunt Sunday. Lillie's mother (my daughter Jessica) went up with us. She had a cold so she fought a cough and runny nose all weekend. Saturday morning we didn't see any deer from the stand so sometime before lunch me and Lillie took a short trek on the ATV along a tree line to the west. At some point along the way, the timber looked and felt right so we stopped. I had her walk quietly into the edge of the woods, gun at ready, to see if something might spook. When a small buck did finally jump and run, there was no chance for a shot. I saw it before she did but even if I'd been the hunter I don't know if I could have got off a shot. 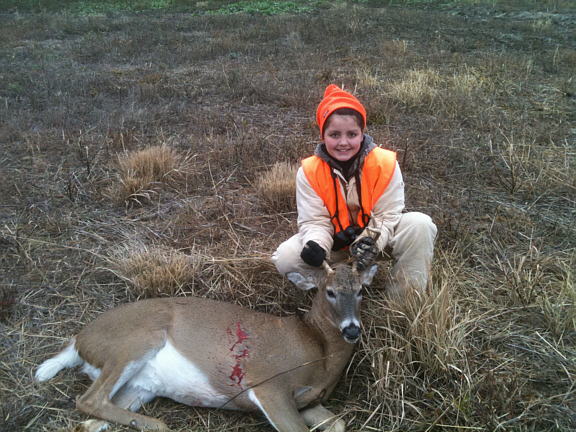 Lillie did shoulder the gun and attempt to get the deer into the scope but he vanished before that was accomplished. EDUCATION never comes free. She did nothing wrong but she did learn how quick everything can happen. So we poked around the timber a little bit and I worked to show her how I do things when sneaking through the woods. Small, soft steps, stopping frequently to take in the ever changing view. She's kind of a long legged squirt anyway so she had a tendency to take long strides but after a few minutes I think she began to understand how to walk quietly. The neighbors were combining beans early afternoon so we gobbled down a sandwich and headed for the stand. Jessica gave up on controlling the cough and went back to the trailer before the "witching hour" that being the last hour or so of daylight. We still didn't see a thing. Before dragging out all the mess to eat some supper we had to decide if we were going to spend the night and hunt Sunday morning or not. While no one was overly excited about the prospects of another night away from home for what could turn out to be nothing, we decided to stay. At 2:30 A.M. when the trailer battery died and killed the furnace, I considered the intelligence of that decision. But, like a good soldier, I solved the problem and was back to sleep in a little while. I woke 1 minute before the alarm went off. To say I didn't want to get out of my warm bed and fight my way to the stand would be an understatement. Lillie apparently didn't want to get up and moving either as I heard pieces of the conversation from the other room. Jessica stayed behind to cough enough to keep the mice and elephants from invading the trailer and Lillie and me road off to meet the sunrise. Temperature wise, it was a great morning for a youth to be in the field so we sat quietly and comfortably watching for deer to show themselves. They chose not to so after considering my options, I decided to leave Lillie in the stand and try to walk something out to her. I did not leave in stealth mode nor did I sneak through the timber in front of us as I pushed back towards the stand. Shortly after starting the return route I spotted/jumped a deer that headed east but I only had a fleeting glimpse before it vanished. I walked on figuring it would either walk past her or not but knew I had no control of it. As I neared the end of the push I heard the bark of the Ruger Compact in my granddaughters hands. I moved quickly to a vantage point expecting I might see a deer racing away wounded or not. I saw nothing so after too little time, I stepped into the open so Lillie could see me. And from the stand I heard a very excited little girl exclaim "I got one grandpa". With no other option but to yell back I said "is it down?" "Yes but it's still moving around"
Then I realized that I had not shown her how to cycle the bolt (expecting that someone would be sitting with her). So with some back and forth yelling, I got her to open the bolt, put the gun in safe mode and re-close the bolt. I asked if the deer was still moving and she replied "no". So I said "OK, look at him with your binoculars." She reported there wasn't any sign of movement. Then I had to try and figure out where the deer was by hand signals. Long story short it was basically between me and her but so was a tree line. I got out in the open further where she could keep an eye on me and started walking towards her. Shortly I spotted the deer laying out in the open beyond the trees. I got close enough to it to tell it wasn't going anywhere and instructed her to leave the rifle in the stand and come to the deer. You ever yell for somebody only to realize they're standing behind you? She got there about that quick. I didn't think to tell her to smile but obviously I didn't have to. Actually, I was too choked up to say much more than congratulations. When I regained composure I would be able to get some details. Before I could send the picture to her mother my cell phone rang. And within a couple of minutes Jessica was there on there on the ATV. Digressing briefly, earlier that morning Lillie had spotted a squirrel and I had her find him in the rifle scope. She was able to do that which was encouraging. I told her that one of the nice things about my deer stand was that the deer don't know you are here. I said "so the tricky part is to quickly get them in the scope and then take your time pulling the trigger." As I left the stand for the push, I explained to Lillie where I was going and what I was doing. I pointed to the direction I would be coming from so "watch for me, if you see orange, do not shoot in that direction no matter what." I asked "how many clicks for the safety to be off" she replied "2" (it's a 3 position safety). I asked "what color do you not shoot towards?" she said "orange." I felt I had done all I could do to prepare her and was on my way. In route back her direction I kept plenty of trees between me and her and stayed down in the creek bed when possible. As long as I couldn't see the stand I knew I was safe. Not that she is careless at all but asking her to watch hard for the first deer of her life and watch for orange was requesting a great deal. So, event details. The buck had come from the north and was apparently the deer I had spotted. It walked out in the open towards her stand and was walking when she pulled the trigger. She said when she "got the scope on him, the scope was where it was supposed to be so I pulled the trigger." 1 shot, through the boiler room and it fell in it's tracks. 62 yards. Just a perfect set up for a 1st time shooter. The start of what will be hopefully be a lifetime of deer hunting like I have had the pleasure of myself. My Dad would be proud ! He started this with his first kill in the very early 1960's.